Just in time for our 100th anniversary, we are proud to announce our newest line-up, G8 Series, also known as Generation 8 series. We have upgraded our entire drive chain series including standard Roller Chain, Neptune Chain, Lambda Chain, and Heavy Duty Drive Chain. The primary concept behind our G8 series is “one hundred years of fundamental technology” representing 100 years of excellence in performance, quality, and innovation. It is our 8th model upgrade that exhibits more improvements and higher performance. Tsubaki has invested its resources in developing an in-house lubricant, GS Lube, which is applied to our chains. The pre-lube is designed with optimal ingredients that enable increased wear life of 20% compared to its predecessor. This lubrication was developed in response to our customers' request for a less tacky solution. Thanks to Tsubaki’s ability to provide innovative lubrication, we were able to solve our customers’ problems and design a less tacky lubricant with improved handleability. This new lubricant will make the chain replacement process much easier. The G8 Roller Chains still need to be lubricated, however, our pre-lube will increase the wear life by 20% until the first time the chain is lubricated. The pre-lube will work optimally within the temperature range of -10 to 60⁰ C.
Neptune Chain provides superior corrosion and chemical resistance. It is safe and eco-friendly as no harmful substances are used on Neptune’s surface treatments. 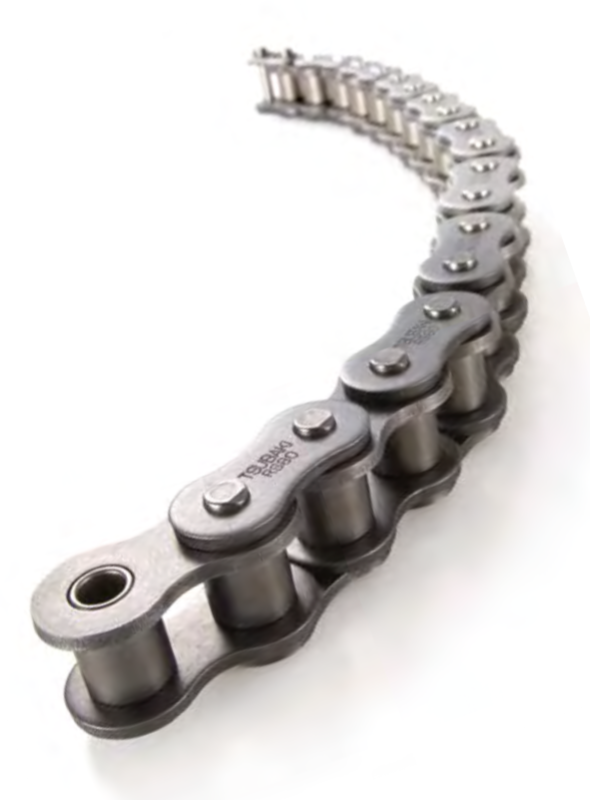 These chains have the same tensile strength and allowable load as our standard roller chains, due to the implementation of a uniquely formulated treatment process. Neptune delivers improved protection with 700 hours of corrosion resistance and 2000 hours of chemical resistance. Although the majority of our customers were happy with the previous levels of corrosion resistance provided by the Neptune series, there were a few cases of premature corrosion when exposed to chemicals. Tsubaki’s solution was to develop a 2-layer combination, which included a uniquely designed special coating and a resin coating. Neptune will function optimally within the temperature range of -10 to +150⁰ C. However, lubrication is required when exposed to high temperatures above +60⁰ C.
Lambda Chain is lube free, eco- friendly, and long lasting. Lambda does not need to be lubricated because it utilizes special oil-impregnated bushes. Consequently, there is less maintenance time required, lower chain replacement costs, and higher equipment reliability. Additionally, you will have equipment that is more clean and a clean working environment where your production activities can operate efficiently. Wear life is doubled through the use of improved sintering materials, optimal sintering density, and controlled production. This is due to enhanced oil-impregnated sintered bush materials that are made in-house to ensure quality and strength. Sintered bushes now use a superior NSF-H1 standards certified food grade oil. This ensures that chains are safe to be used on food equipment while providing a better wear performance. 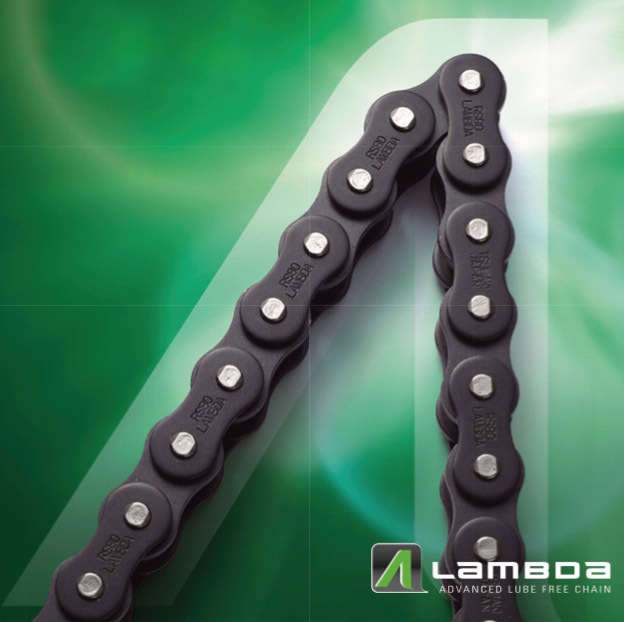 Lambda is compatible with standard roller chain and standard sprockets to ensure smooth transition. It will work optimally within the temperature range of -10 to 150⁰ C.
G8 Heavy Duty Drive is exactly like how it sounds: stronger and long-lasting. Heavy Duty Drive Chain has higher minimum tensile strength and maximum allowable load compared to our standard Roller Chain. Within the G8 Heavy series, you can choose from HT Chain, Super Chain, Super-H Chain, and Ultra Super Chain. With different models to choose from, you are sure to find the perfect chain that fits your application needs. HT Chain offers double the wear life through the use of our newly developed solid bush, optimal steel, and heat treatment methods. It has better handleability, due to the optional use of ring coined slip-fit connecting links. 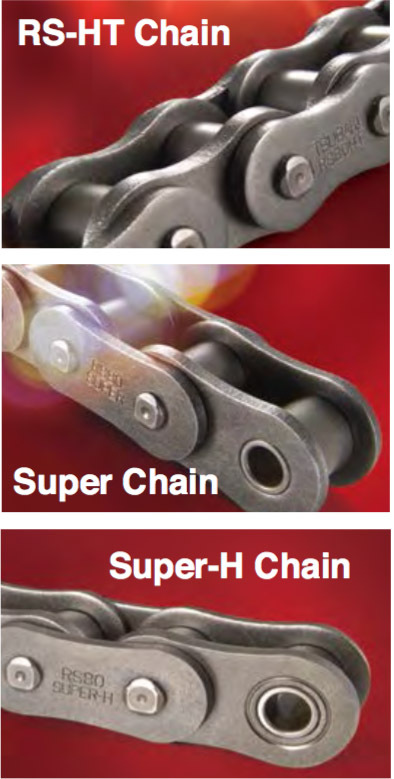 Super Chain has 5-10% higher maximum allowable load and the same fatigue strength as before. This is due to changes in Tsubaki’s design engineering and manufacturing prowess. Changes were made to the plates, pins, interference area, and assembly process. The plates were changed to increase rigidity and shot peening provided added residual compressive stress. Pins use quad-stake riveting to reduce the chances of a fracture occurring from pins coming out. Hardened, high-strength steel pins have increased impact resistance. Additionally, high proof-loading has reduced assembly distortion by a significant amount. Super-H Chain has 20% higher maximum allowable load than previous Super H-chain, through the use of ring coining around inner plate holes to increase fatigue strength. One strand has the same fatigue strength as a double strand roller chain. Despite the upgraded features, the prices and delivery time will remain the same. Try our robust G8 Heavy Duty Drive chains and start saving money without compromising on quality and performance.